It is no surprise to us that you ladies love Shucks Tiger Pearls as much as we do. They are beautiful and would compliment any gameday outfit. One lucky Clemson Girl is winning a gorgeous Tiger Pearls necklace of her very own. Congrats Lauren!! Please email us as soon as you can to clemsongirlblog@gmail.com to claim your fabulous necklace. If we do not hear from you in 48 hours, we will draw a new winner. Special thanks to Donna and Keith of Shucks Pearls for sponsoring today's giveaway. If you haven't already, check out the entire jewelry line of orange, purple and white Tiger Pearls. 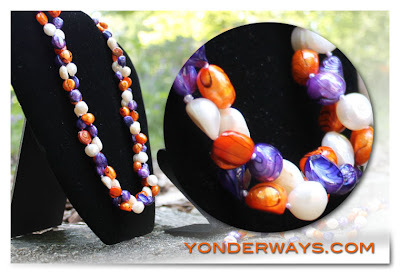 Don't forget - Shop Yonderways.com for Shucks Tiger Pearls, use coupon code 'clemsongirl' and get FREE shipping.